Do you require aggregates for your next construction or renovation project in Dorset? If you do Avon Material Supplies are now able to supply its range of primary and recycled aggregates in bulk bags. Bulk bags, sometimes referred to as builders bags or 1 tonne bags, are heavy duty bags that can hold up to 1 tonne of material. They are frequently used in DIY projects and on building sites with limited space, or where the required aggregate is only needed in a small amount. What aggregates can be supplied in bulk bags? To see the full range of AMS aggregates, please visit the ‘Materials’ section of our website. Unsure on the best aggregate for your project and how much to purchase? To receive samples of our primary and recycled aggregates, please contact our on-site team on 01202 579579 or email enquires@avonmaterialsupplies.co.uk. Estimating the number of builders bags required to complete your task can sometimes be difficult. Our staff can complete an estimation calculation for you, simply call 01202 810938 and let us know the width, length and depth of the area you wish to fill. 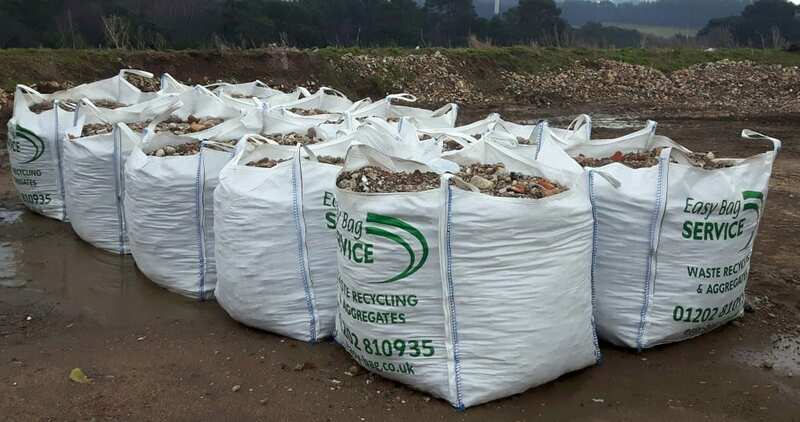 Our bagged aggregates can be collected directly from the Inert Facility at Canford Recycling Centre by businesses or tradespeople with the appropriate vehicle at their disposal. The site is open all day Monday to Friday and Saturday mornings, but please note all bagged collections must be pre-booked, to do this please call our on-site team on 01202 579579. To place an order or for further information about our aggregates in bags, please call 01202 810938 and we’d be happy to help answer any questions you have or assist you in ordering.